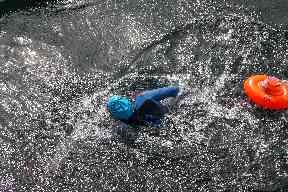 From icy lochs to cool dark seas brave swimmers are fighting childhood cancer. 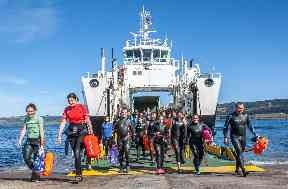 In the freezing, fast-flowing waters of the Sound of Mull dozens of intrepid swimmers begin the challenging route towards the mainland. A tough journey almost 3km in length, people of all ages and abilities take to the water, some wrapped up against the elements in wetsuits and others braving the cold in swimsuits and shorts, all marked with fluorescent orange floats. Tackling the strong waves, they are rewarded with a view of stunning snow capped mountains against vivid blue skies, and the chance to see nature at play, from common porpoises and bottlenose dolphins to curious grey seals. They are guided by Jeff Forrester, who simply describes himself as "the guy who came up with the daft idea", after jokingly suggesting to a colleague that they both swim from the Isle of Mull where they were working together. While the 54-year-old from Loch Sunart laughs, remembering how his friend hid from him for the rest of the day, an idea had nevertheless begun to grow. A fan of the water, Jeff had undertaken numerous personal challenges for charity over the years, but felt guilty that the same people would sponsor him each time. So instead, he openly invited other people to join him in the cold waters off the west coast of Scotland and donate to Children with Cancer UK as a fee instead. "When I actually set it up and decided to do it, I wanted it to be challenging and I wanted to be able to invite people," Jeff explains. "By inviting them, instead of paying for me for organising it they would pay money directly to charity. "So it would tick that box but it would also bring like minded people together." 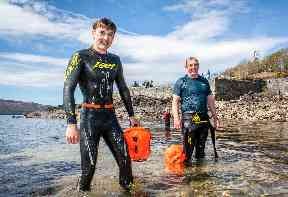 Creating the Highland Open Water Swim group in 2015, Jeff was insistent that the group would not be a professional club or organisation, rather a space for people intrigued by the idea of open air swimming surrounded by Scotland's stunning landscapes in conditions a little more challenging than the average pool. "We've got all of this, which in a sense is free and on your doorstep, why wouldn't you take advantage of that," he says. 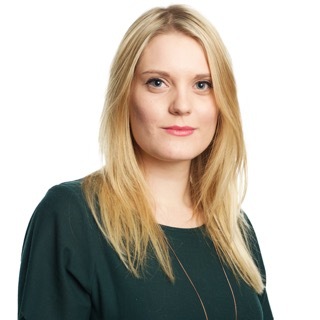 "People are travelling long distances to come to these events now." 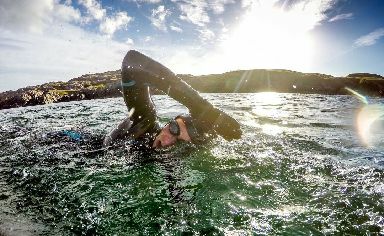 With swimmers venturing up from Edinburgh and Glasgow all the way to Inverness and beyond to swim on the west coast, Jeff says that as the community grows, more people become interested in the open air swims, with even one person from Norway asking to be signed up for the next event. Jeff explains that swimmers of all abilities are welcome and he firmly believes there are no first or last places, just challenges set to be overcome by each participant. At the event at Corran Narrows in March, Jeff says he waited by the shore for the final participants to come in and comforted an upset swimmer who protested that she had "come last" in the event. Jeff explains: "She was very emotional when she came out and I said 'lots of people can say they have travelled across on the ferry, you're one of the very few who can say you've swam across'. "As soon as I said that the tears subsided and there was a huge smile on her face." While the swimmers have steadily joined the group to take to the waters for charity, there is far more organisation involved than simply slipping on a pair of goggles. Jeff says that the volunteer support he has received has surpassed his expectations, from those who offer safety support from ribs and kayakers who paddle alongside swimmers to guide them on their way. Local hotels help with cups of tea and pots of soup to warm up with on the shoreline and one couple made a 700 mile round trip from the Midlands just to support the swimmers in their kayaks, he adds. 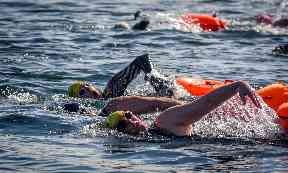 But there are other reasons volunteers donate their time to the open water swims. Nick Ray who lives in Tobermory paddled 34 miles in one day to travel to the event in Resipole on Loch Sunart, offering safety support before paddling home again. Jeff says: "The reason he said he wanted to be involved was that his son had cancer at a young age, it just takes your breath away and it makes it a bit more real. "When I said will you come and help us with the Mull swim, he said he'd love to but that his son was getting married that weekend. It makes everything really real." He adds: "Lead kayaker Tony has helped us through all the swims and he waited till the Mull one to tell us his personal reason for getting involved was that his son died at a very young age from cancer. "He said they now have cures that would have cured him had he had cancer now. "I had no clue about this, halfway swimming across the Sound of Mull I was still crying." 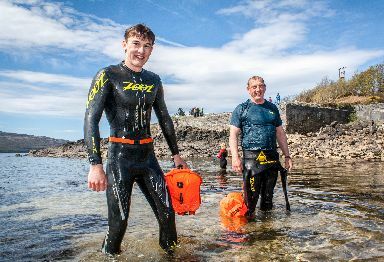 Since starting the open air swims, intrepid participants have braved the waters at the Falls of Lora near Oban, a route near the Skye Bridge, a stretch of water by Ballachulish and the waters outside Jeff's front door at Loch Sunart among others. Jeff is determined that the open water swimmers can break their target of £5000 for the children's cancer charity and hopes to organise a few more swims towards the end of the year. He says: " I'm very fortunate I have a wonderful partner, I have two beautiful healthy boys and I'm very very lucky. "I want to be a good example to my boys and I want to show it's not about taking in life but giving something back."